Everyone has special places. Spots where you can relax, daydream, be creative. Our newest online class project depicts one of those special places. We have designed a beautiful ladies desk and matching slipper chair, perfect to sit and compose a letter to that special someone. Students will construct and paint the desk which is made of basswood with 3d printed cabriole legs. 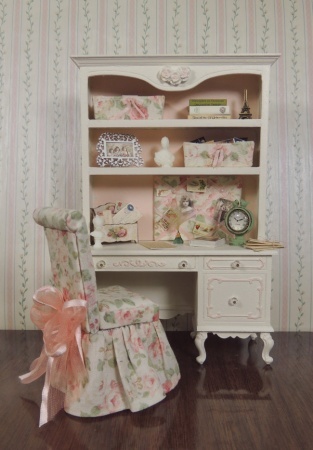 Then, they will create a collection of little treasures to fill the desk, including a darling ribbon memory board, romantic letter holder, shabby chic clock, fabric storage bins filled with ephemera, and other lovely details. Refer to additional photos below for more details. The darling, yet elegant slipper chair is so much fun to make. Created with a wood base, and covered with the same lovely cabbage rose motif fabric used on the memory board and storage totes. 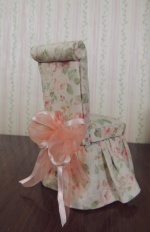 Sweet and feminine and yet, easy to make, you will find yourself using this design in future projects. As with all of our online projects, all materials to create everything shown in the photo are included in the kit. Students will provide glues, paints and basic tools. Space will be limited and is offered on a first come first served basis. A $5.00 early bird registration discount is given to students who register before April 19th. Use discount code EARLY BIRD when checking out to receive your discount.